by Eleanor Davis. Bloomsbury. 2009. Review copy supplied by publisher. 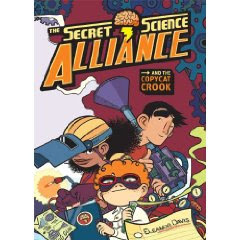 Official Secret Science Alliance website. All ages. Graphic novel. The Plot: Julian Calendar, eleven, outwardly looks like a nerd and inwardly is actually an ultra nerd. He's smart, he's inventive, he cannot help or hide it, even in his attempts to make friends at his new school. When he stops pretending, he meets Greta Hughes, outwardly a bad girl, and Ben Garza, outwardly a dumb jock. Greta and Ben are ultra nerds like him, and together they form the Secret Science Alliance. The Good: This better be the start of a series! We get the origins of the SSA, including what has to be one of the best top secret laboratories and workshops in the hideouts. It's full of stuff (including a bathroom!) and is neatly hidden from view because it's the forgotten basement of a long-ago torn down house on a vacant lot. What's not to love about three kids who are outsiders who are brought together by their love of science, invention, and fun? The last part of the book involves their loss of their Invention Notebook, and plan to recover it and stop a criminal that is an Oceans Eleven caper for smart tweens. Bonus points because it's three kids, using all their smarts and invention and science skills. See that cover? Diversity; and diversity that is included throughout the book. Any picture that is depicting the kids at school or other crowd event? Equally diverse, in terms of not only skin color, but also size and ability. Some kids are in wheelchairs; how often do you see that? Not often. The diversity also carries over to economics; one family lives in an apartment, one in a house, one in a duplex/twin. The kids are eleven and twelve; and I'd call this an all-ages book. It has appeal for just about everyone, is fun, smart, and entertaining. Some of the jokes are for older kids (and grownups), such as Julian's name and the names of his siblings. The artwork is full of details; you can see sample pages in the links given above for the official book website. It's also full color. And finally...if MotherReader was using this for her Ways to Give Gifts posts, she'd say match it up with a chemistry set or any type of inventors set. I'll be adding this to my favorite books read in 2009. Amazon Affiliate. If you click from here to Amazon and buy something, I receive a percentage of the purchase price. How Do You Read That Book? 31 Blogs...and a Contest, Too!